My brother is the grill master in the family, and when he recommends a recipe I usually try it out as soon as I can because I know it is going to be good. The only problem is that he is one of those crazy people that grills year round, even in tough Vermont winters, so when he recommended this recipe to me it was January. As in, snowy, cold, wet and definitely not grilling season in my book. Now that the weather is warm again and the grill has been dusted off, this recipe has become a favorite in our house. It is easy, has simple ingredients, and tastes wonderful. The chicken thighs are marinated in a simple marinade that gives them a delicious sweet and sour flavor after grilling. 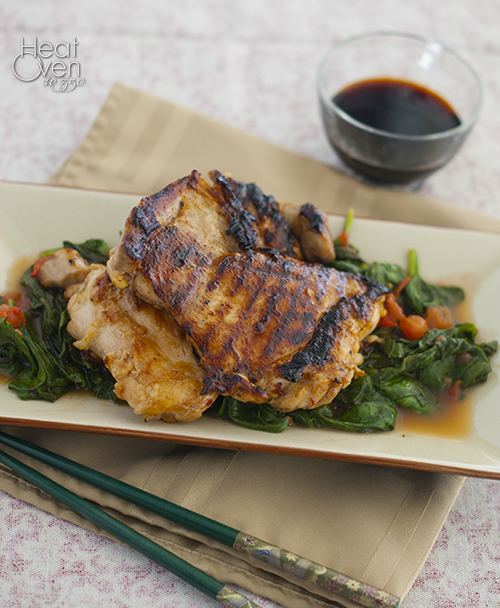 The marinade is saved and cooked with spinach until the spinach wilts, giving the spinach the same great taste. Chicken thighs are great on the grill because they don't dry out as quickly as chicken breasts so even someone without great grilling skills could make these turn out great. They also happen to go on sale where I live fairly often, making this a cheap recipe, too. I almost didn't try the spinach cooked in the leftover marinade because I wasn't sure I would like it, but my brother specifically recommended it and I am glad he did. It is so fast and easy, but really tastes great and is delicious with the chicken. I love recipes with a built-in healthy side dish. Kick off your grilling season with this delicious chicken dish and you will be happy you did. Combine rice vinegar, canola oil, granulated sugar, soy sauce and chili-garlic sauce in a medium bowl. Pour marinade into a ziploc bag and add chicken thighs. Close the bag and refrigerate 1-2 hours, turning occasionally. Remove thighs from ziploc bag and save marinade. Grill thighs over direct high heat, turning every 3-4 minutes, until cooked through, about 10 minutes. While thighs are grilling, pour reserved marinade into a large skillet and bring to a boil over medium-high heat. Let boil for 1-2 minutes, then add spinach and tomato. Cook until spinach is wilted, about 3-4 minutes. 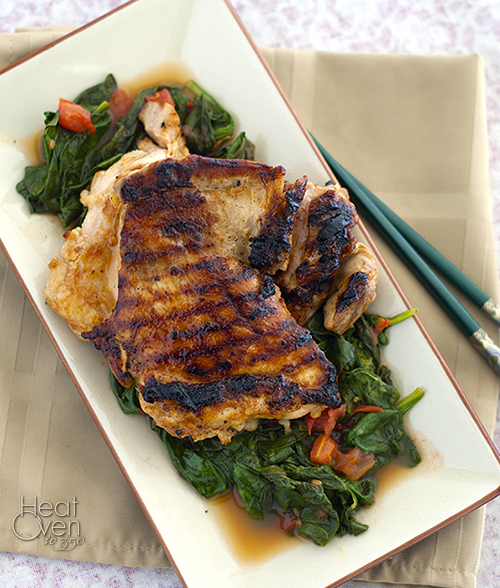 Serve grilled thighs over warm wilted spinach. this looks really amazing Nicole. I'm a huge fan of wilted spinach and chicken thighs! We just got a gas hookup put outside so we can buy a grill, and I can't wait! These sounds awesome. Love that you used chicken thighs (my fave piece for sure)!